In recent years, wild peach, with its natural and unique beauty, has drawn much attention. Many people have spared no effort to go to northwestern provinces such as Lao Cai and Son La to buy a peach branch for the traditional Lunar New Year or Tet. Vietnam Typical Tours is honor to help you by presenting some information before you come to Sapa in holidays as well as exlxporation. 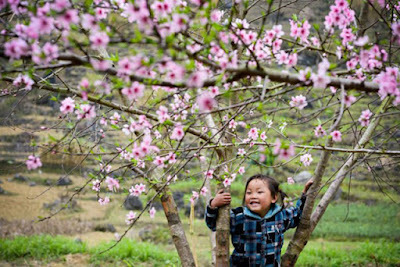 Visitors to Sapa won’t have to wait until spring to enjoy the ubiquitous and vibrant peach blossoms, as the warm weather has brought them so early in recent years. Spring is a long way away, but many peach trees on O Quy Ho Mountain, and some commnunes of Ta Phin, Sa Pa in Sa Pa District, Lao Cai Province have already begun to blossom. According to director of Lao Cai Province Department of Agriculture & Rural Development, Ma Quang Trung, these trees have bloomed two or three months ealier than usual. Although it makes for a more beautiful fall, "This means that we won't have peach flowers for Tet. Since they are blossoming at the wrong time, they will not fruit, which means a poor crop next year," he says. Deputy director of the provincial Centre for Hydrometeorological Forecasting, Luu Minh Hai, says that this is a strange phenomenon, which indicates unusually warm weather, and possibly more frost in the coming time. Wild peach blossom often has a lighter pink than those grown in Hanoi ’s Nhat Tan village. From the 16 th or 17 th day of the last lunar month, Mong ethnic minority people bring peach branches to towns to sell. On these days, downtown Sapa is filled with such branches. The price here is quite cheap, between 200,000 and 300,000 dong per branch. Thao A Denh, a Mong man in Nam Cang commune, Sapa district in Lao Cai province, said this year’s prolonged cold killed many kinds of flowers and growers have to sell peach branches to make money for Tet. 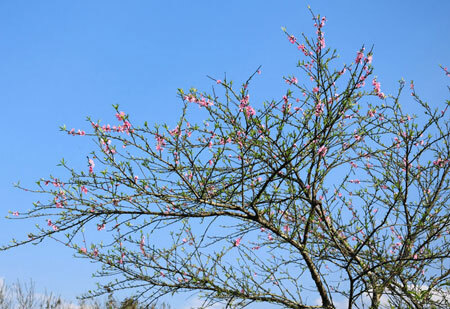 Wild peach branches are now displayed along National Road 4D from Sapa to Lao Cai city. People from many places have travelled a long distance looking for beautiful branches. Tran Vi Luong, a resident from the northern mountainous province of Lai Chau , said as the Lunar New Year is approaching, he organises a tour of the wild peach market and buys a branch for his family. Wild peach has a natural beauty so bringing the nature home is very interesting, he added. Wild peach branches are also present at the Quang Ba flower market in Hanoi to serve the demand of the capital’s residents. Although each branch costs several million dong, it is still the choice of many customers. Enjoying wild peach during the Lunar New Year is an elegant custom. Together with other kinds of flowers, it has helped make the spring more colourful and fragrant. 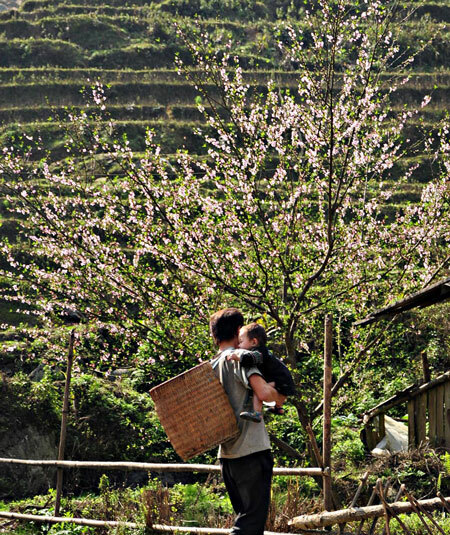 It is advisable that visitors should come to Sapa in the winter and feel the coldness and have chance to see the real natural beauty of Sapa flower peaches on the roads, in the garden. In order to provide visitors with the most common knowledge about Spring in Sapa, please see Sapa Classic Tours.